3 What Is an Epilator? 7 How to Use an Epilator? 8 How to Use an Epilator on Your Face? 10 How Often to Epilate? 14 How to Make Epilation Less Painful? 16 Do Epilators Cause Ingrown Hairs? 19 Epilator Vs. Waxing – Which Is Better? 20 Epilator Vs. Shaving – Which Is Better? 21.1 Q. Does more hair grow back if I epilate? 21.2 Q. How to prepare skin for epilation? 21.3 Q. Benefits of using a wet and dry epilator? 21.4 Q. How to exfoliate for epilation? 21.5 Q. 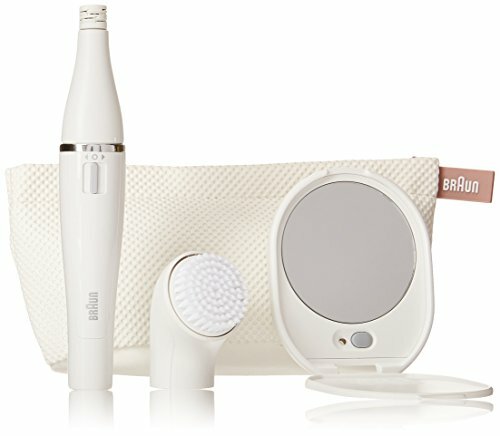 What areas of the body can an epilator be used on? 21.6 Q. When is the best time to epilate? 21.7 Q. How important is exfoliation? 21.8 Q. What if I have sensitive skin? 21.9 Q. How to clean an epilator? 21.10 Q. Will epilation reduce my hair growth rate? 21.11 Q. Is it okay to let someone else use my epilator? 21.12 Q. Will the epilation process darken my skin? Are you tired of that annoying unwanted hair on your body? Are you dreaming of a silky smooth skin? The most affordable methods of removing unwanted hairs are with the use of disposable shavers or waxing. However, shaving can be not as effective and waxing is quite a painful process. So the next solution is using an epilator, which will provide you with a silky smooth skin for a couple of weeks or so. It’s not as painful as waxing and is definitely less hassle than shaving every day. But what is the best epilator on the market? After comparing and researching the most popular models available on the market in 2019, we have compiled this list of top 10 products. You can compare epilators in the table or read our epilator reviews below. At the end of the page, you can also find a guide on how to choose and buy the right epilator. One more great option among best high end epilators is the Emjoi AP-18 Emagine model. It’s equipped with features that make the epilating process more comfortable and more efficient. You can use it on the bikini line (top bikini shavers and trimmers), legs and underarms. The Emjoi Emagine features 72 tweezers, which is the most you’ll find on any epilator on the market. This considerably reduces epilating process time and gives you hairless skin for up to 6 weeks. The dual opposed heads of the Emagine keep the skin taut, which helps to eliminate ingrown hairs and minimize pain. Additionally, using the Glide Technology, the epilator lifts up the hairs and the tweezers glide over the skin. This really helps to minimize irritation. Pros: 72 tweezers, thorough epilation, minimum pain, ergonomic design, prevents ingrown hairs, can be used on all body areas except face, dual speeds, easy to clean, 1-year warranty. Cons: corded, not for face, there’s no built-in light. 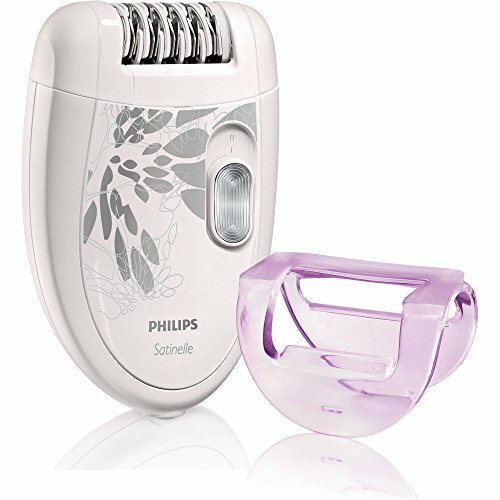 If you are looking for the best affordable epilator, then one of your top considerations should be the Philips Satinelle Essential model. It’s the best selling epilator on Amazon and for a good reason. For its low price tag, there’s no other model that can beat its efficient performance. Philips Satinelle is specifically designed for epilating legs. But it can also be used in the bikini area and arms. However, it’s not recommended to use on the sensitive skin of the face. It features an ergonomic design that offers a very comfortable grip. The epilator is equipped with 21 tweezers that pluck out the hairs. The two speeds allow you to choose a more gentle speed when epilating more sensitive areas or finer hear or speed up when epilating more coarse hair. Pros: affordable price, plenty of tweezers to remove the hairs by the roots, dual speed, ergonomic design, the removable head is washable, includes an efficiency cap to ease the pain, 2-year warranty. Cons: not for face use, not cordless, compared to more powerful models it takes longer to epilator more coarse hair. One of the top epilators that offer the most high-end features is the Braun Silk Epil 7. This model was designed for use on the entire body, including legs, underarms, bikini area (bikini wax kits compared), and face. It’s a wet-dry epilator, so you can use it in both wet and dry environments. This epilator pulls out the hairs that are as short as 0.5 mm straight from the roots, which will leave you with smooth skin for about four weeks. The 40 tweezers feature a close grip that allows the removal al of even the shortest hairs. More tweezers also mean faster epilating, but the balanced amount of tweezers this epilator has also meant that it won’t be as painful. There are two speeds for either gentle epilation or more efficient. The massage system of the Braun Silk Epil 7 stimulates the pain during epilation. The Smart Light feature that illuminates the area you are epilating, making sure that all the hairs are plucked out. Pros: waterproof and cordless design, includes 5 additional attachments, very effective at removing even the smallest hairs, 2 speeds, fast epilation, Smart Light feature, flexible head, designed for the whole body, easy to clean, 2-year warranty. Cons: can be loud, cannot be used when charging. 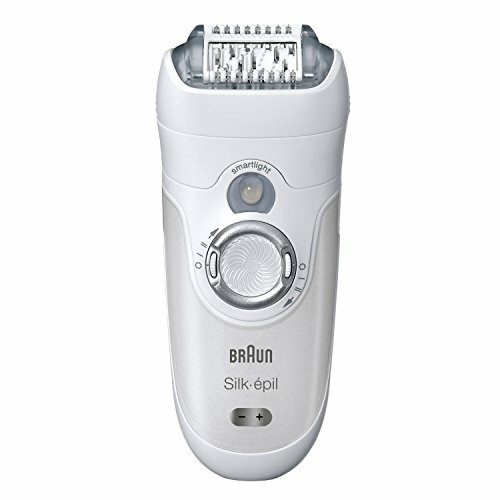 Braun Silk Epil 9 is one of the most popular models on the market, lately. It has the power, efficiency and the looks in one package. When compared to the other Silk Epil models, this model features a 40% wider epilation head which means removing more hair in one stroke. The most outstanding feature of this model is its most innovative MicroGrip tweezer technology. It has 40 tweezers as Silk Epil 7 still but with one difference. This technology provides you with a wider and longer tweezers fit for removing hair deeper. As a result, it will enable you to remove hair four times shorter than wax does. Braun Silk-Epil 9 is a wet and dry epilator, so you can use it in a bath or shower as well. 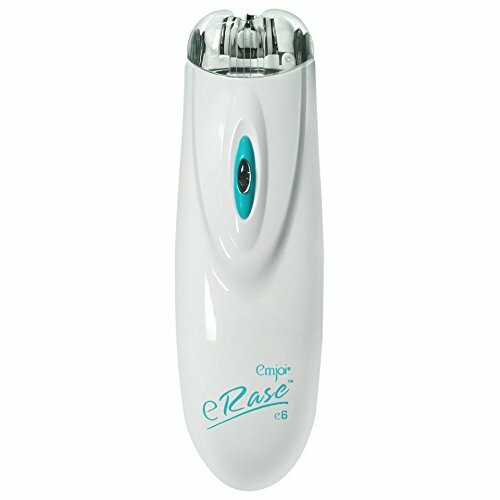 It massages the skin to ease the pain, comes with a skin contact cap that lets the tweezers make direct contact with the skin, soft lift tips for removal of flat-lying hair, a built-in light to see the hair better, a pivoting and washable head and two speeds for gentle or more efficient epilation. Braun Silk Epil 9 epilator promises a smooth skin for up to 4 weeks and user reviews tell that the product lives up to the expectations. Braun Silk Epil 3 features a 20 tweezer system that provides easy hair removal from the roots, leaving skin smooth and shiny. This epilator also does not run on batteries but is a corded unit. Rechargeable models are usually pricier. 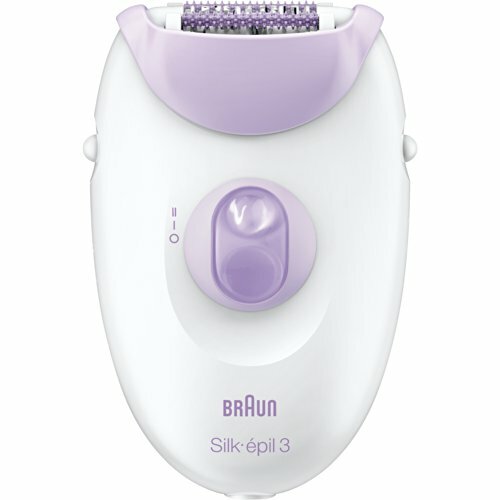 Like on the previously mentioned models, Braun Silk Epil 3 also offers 2 speed that you can choose depending on if you are epilating more fine or coarse hair. The Silk Epil 3 epilator features a massage system that effectively soothes the plucking sensation by stimulating the skin during the epilating process. This results in maximum comfort and minimum irritation. The construction of the epilator includes SoftLift tips that are designed to remove even the flat-lying hairs. This model also includes the same SmartLight feature as on the Silk Epil 7 epilator. This feature is really helpful in ensuring that you don’t miss any hairs during the process. Pros: 2 speeds, SoftLift tips, removal of hairs from the root, SmartLight illumination, high-frequency massage to prevent irritation. Cons: corded, not for face use. Panasonic ES-ED90-P features a compact cordless body in bold pink and white colors. This model includes many different attachments and provides some of the least painful but most effective epilating experience. 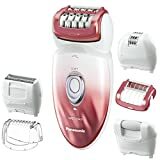 This Panasonic epilator includes 6 additional attachments: epilation head, foot care head, bikini cap, shaver head (comparison of electric shavers for women), epilation gentle cap, and an epilation beginner cap. The size of the epilator is convenient for travel and the included travel pouch adds to that. The 6 oz weight adds to its convenient portability. The Panasonic ES-ED90-P offers the option of using either wet or dry operation. This helps the women enjoy a less painless epilating experience and also adds convenience when using it. A LED light helps to see even the tiniest hairs, improves accuracy and makes sure that no hairs are left. The 60-degree pivoting heads of the epilator are designed to reach the most awkward spots and areas over the knees. The epilator is also kind on sensitive skin, with the hypo-allergenic blades leaving no red marks. The Philips HP6576 Satin Perfect will give you the ultimate epilation experience, leaving your skin smooth for up to four weeks. It features an extra-wide head with textured ceramic discs that gently remove hair in just one stroke. This epilators is very gentle on the skin, so it can be used on sensitive areas, such as face, around the bikini line and under the arms, as well as on other parts of the body. The ergonomic head features an active hair filter that provides high efficiency by making the hairs stand up for easy epilation. The epilation is then following gentle vibrations of the massage system that helps to stimulate and soothe skin. The unit is equipped with 32 hypoallergenic ceramic discs that help to remove even the finest hairs with maximum speed and comfort. The Philips HP6576 also offers a speed control feature with two speeds designed to target different areas of the body. To help keep the epilator at the ideal angle for maximum efficiency, the performance cap provides pivoting movement. This Philips epilator offers the largest range of attachments, which include a trim, shave and style attachments. The tweezer set comes in an elegant case with light and mirror. The cordless design provides easy, on-the-go use and with 40 minute operation on one charge, it’s perfect for taking it along on travels. One of the best rated epilators designed for face and other sensitive areas is the Emjoi Epi Slim model. It features a slim and compact design, as well as battery operated operation, so you can use the epilator anywhere you go. Being designed specifically for sensitive skin areas, it’s not the best option for legs. The tweezer discs feature a narrow design, which helps to remove hair from the root. It carefully covers small areas, providing efficient yet gentle epilation. Due to its narrow design, it will work well on the bikini line, underarms, upper lip, chin, and cheek. It might not be the fastest epilator, but it gets the job done well. The epilator fits nicely in a hand thanks to its ergonomic design. The Emjoi Epi Slim is a great option if you are looking for a reasonably priced sensitive areas epilator that is also highly efficient and conveniently portable. Emjoi Soft Caress epilator comes in a very sophisticated look in royal purple and white color combination. The silky smooth skin is provided by the 24-karat gold plated tweezers, which really catch attention and add to the really nice look of the epilator. It’s a small epilator that can be operated as a corded or cordless unit. It features a built-in battery that you can recharge with the included cord in the package. This becomes a really nice convenience when traveling. There are 36 disc tweezers that easily pull the hairs out from their roots. After each hair strand is removed, a massage finger system relieves the pain and eliminates any red marks. This Emjoi epilator is also hypoallergenic and includes a protective shield with a Silver-ion technology to keep the skin safe from any bacterial harm. It also protects the skin from rashes and irritation, caused by epilation. 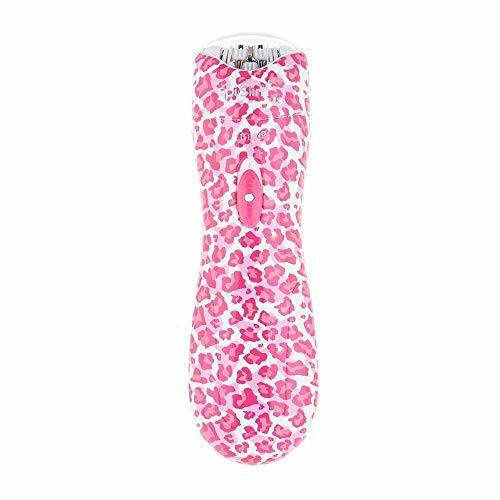 The package of this model includes a travel pouch, which you can use to keep things organized or it comes handy when you take the epilator for travel. 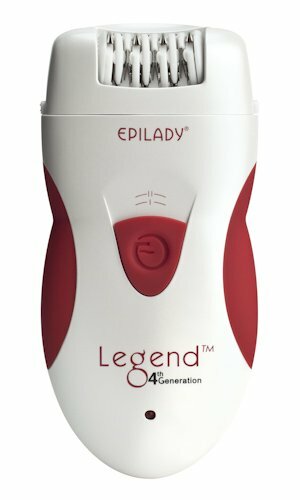 One of the latest editions in the Epilday’s line of epilators is the Legend 4 model. It’s a full-size rechargeable epilator designed for hair removal on all areas of the body, providing smooth skin for 4 to 6 weeks. There’s an option of using this unit either cordless or with the cord connected. Either way, you will have the same power and efficiency. The wide epilating head features the perfect angle guide that helps the user epilate at the perfect angle for maximum efficiency. The 40 tweezer discs have the ability to remove even the shortest hair, leaving the skin perfectly smooth. The ergonomic design makes it easy to hold with rubber touch at gripping points. Two operating speeds allow to choose more suitable one when epilating either coarse or fine hair. If you’ve spent much time already browsing the market for facial Epilators, then you’ll know. If not, then let me tell you this one is particularly unique. The beauty edition model from Braun offers the first 2 in 1 model for both facial epilation and an electric facial cleaning brush. The cleaning brush offers you a much more thorough and deep clean than manual cleaning and exfoliating, while also saving you time in your routine. It also gives skin a far smoother, softer feel than traditional exfoliating can provide, which is great. 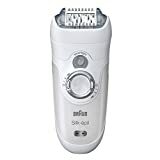 The Epilator also boasts far more effective results than manual techniques, and is a clear cut above most of the low-cost Epilator options available, making this one from Braun a great option if you want a professional standard with a very reasonable personal grooming price tag. The kit includes a carry bag, mirror with LED lights, and an extra slim head to give great precision for those tricky little areas, especially the brow and above the top lip. The Epilator can cut through much shorter hairs than waxing allows, and with a far more painless experience. The areas that use the Epilator on can stay hair free for up to 4 weeks, and the best thing is that you needn’t wait for hairs to become visible since the Epilator pulls out the hairs at the root. Next up is the eRase e6, the latest face hair Epilator from Emjoi. This nifty little gadget using patented disks for pulling the hairs direct from the root. There is absolutely no doubt that for the price this is absolutely as good as it gets! The performance of this nifty little toy comes in close to that of far pricier models out there, so if you wanted a real bottom dollar option, then you won’t do better than this. There are a few downsides to note though, which you might not find with some of the dearer options. Firstly the noise is far louder than some of the more premium models, which can be a bit of a pain at times. Also on the pain note, users complain that this is not the most pain-free Epilator on the market. All of this said though, there is no totally pain-free solution to hair removal unless of course, you want to splash out on laser therapy, which is very expensive indeed. As we said, if you’re looking to try out an Epilator for the first time, but don’t want to spend much, then you won’t be disappointed with the Emjoi eRase e6. Epilators are electrical devices designed for temporary hair removal. They can remove unwanted hair on legs, arms, face, bikini area and the underarms. They work by plucking away the hairs from their roots, thus removing them at the follicle level. These devices are equipped with spinning discs or springs that capture hairs on the skin level, while the moving parts of the device use the rotating motion to pull out the hairs from the root. Epilators are considered to be a quick hair removal solution with a lot of benefits one of which is that the result lasts a long time. The market is constantly expanding with new efficient epilator models with variety for any budget. Epilators can be cordless, battery powered, rechargeable, or directly powered by a cord. Epilators provide a much faster hair removal compared to other methods, and their results last longer. However, they are generally more painful. Spring type. The first epilators that appeared on the market used to have a coil spring. A spring epilator also features a rotating mechanism, so the rotating spring flexes first on one side and then on the other. 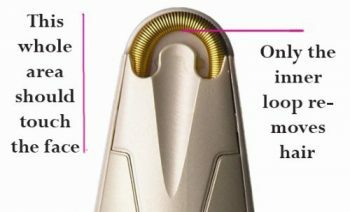 As you move the epilator across the skin’s surface, the coils grab the hairs, while the rotating motion would pull them out. The springs are susceptible to failure as they constantly flex and coil. Today, you will mostly find spring type epilators for facial hair. Rotating disc type. This type uses small rotating metal discs. Remington was the first company that introduced this method. The device of this type works by rapidly rotating these metal discs. The moving tips have an effect similar to tweezers. As the disc tips come close together, they grab multiple hairs and the rotating motion plucks them out. The rotating discs create a centrifugal force, which helps to discard the pulled out hairs. Tweezer type. The head of the tweezer type epilators features tips of the moving plates. As the head rotates, the tips come close catching the hairs between them and apart releasing the plucked out hairs. Most of the modern epilators on the market today are the tweezer type. When you are looking at the various different models of epilator that are available, you will notice that there are plenty of different types of epilators to choose from. You could choose a wet and dry epilator, a dry only epilator, or you could even choose an epilator that has more functions, in addition, to simply epilating. The type of epilator that you choose will depend on your needs and your budget. Remember that the more expensive epilators often have the best features so be prepared to spend a little more. You must make sure that that the epilator that you are choosing is suitable for the area of hair that you wish to remove. You should look carefully at the packaging to determine which area of the body that the epilator is suitable for. You can find epilators that are suitable for the legs and arms only; the legs, arms, bikini line and under arms; and you can also find epilators that are suitable for the legs, arms, bikini line, underarms and the face. You can choose between a corded and a cordless epilator. Some cordless epilators allow you to use them with a power lead or as a cordless model. The benefit of having a cordless epilator is that it makes the device more convenient if you like to travel, or if you want to use it away from a power outlet. On the other hand, you can be sure of having a constant and reliable epilating experience when you choose a corded epilator. Unlike a cordless model, you can rely on your corded epilator to never run out of power so that you don’t have to wait for hours on end until it has charged up again so that you can carry on using it. Wet and dry – A wet dry epilator will allow you to use the epilator in the bath or the shower so that you can combine your entire beauty regime into one session. Massage function – A massage function can help to improve the blood flow to the upper layer of your skin so that you can feel less pain when you epilate. Tweezers – The more tweezers that there are on the epilator head, the more hair will be removed with each pass. The problem with very cheap epilators is that there are only around 20 tweezers or less on the head. 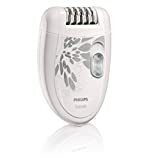 These are not effective at grabbing many hairs in one go and as a result, you can find that you need to run the epilator over the same area many times, causing unnecessary irritation. Choose a slightly more expensive epilator with more tweezers if you want to ensure that your skin will be irritated as little as possible and that all the hairs can be plucked in just a couple of passes. Adjustable speeds – When you are looking for a quality epilator, you will notice that they will usually come with variable operating speeds. Some models only allow you to turn the epilator on or off, whilst others offer low or high-speed operation so that you can customize your epilating experience. Pivoting head – A pivoting head is an ideal design for an epilator. It will follow the contours of your body as you epilate, meaning that you can get into every curve of your body with the epilator. The pivoting head will mean that you can also keep the head as close to your skin as possible so that the hair will be pulled out closer to the root. This will cause less pain and irritation. Built-in light option – Even if you are using your epilator in a well-lit room, you can still find that it is difficult to see all of the hairs on your skin as you epilate. If you choose an epilator that has an integrated light option, you will find that it is far easier to see the hairs that are in the path of the epilator head. Attachments – When you purchase an epilator, it may come with additional attachments that it can provide you with even more functionality. Shaving heads can be useful, as these allow you to trim long hairs down to a more manageable length so that it is less painful when you start to epilate. To prevent ingrown hairs start by exfoliating the skin. The most effective would be a loofah. Alternatively, you can use an exfoliating glove or scrub. Epilating short hair is more comfortable rather than long. Epilating hair that is too long can be more painful and it causes irritation and discomfort. If you are using a dry epilator, make sure that your skin is completely dry and clean. If you are doing wet epilation, you can start by relaxing the skin in warm water. Epilate in straight, vertical lines. This will make sure that there are no missed patches of hair left. As you epilate a certain area, pull and stretch out the skin. This will make the area that you are currently epilating more smooth and will make it easier for the device to pluck out the hairs. Work slowly, so there won’t be any missed patches and all the hairs will be pulled out from the root. For best results, you should be patient. After you finish epilating apply some body cream or lotion. Clean the device, which will make sure that it works properly in the future and doesn’t cause an infection. 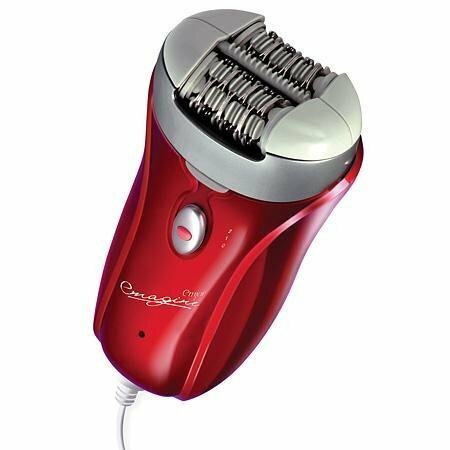 How to Use an Epilator on Your Face? First of all, you will need to clean your face. You should ensure that there is no makeup or creams on your skin. In addition, the hairs should be around a quarter of an inch long. The hairs will be unlikely to be plucked from your skin if your hairs are shorter than this. If your epilator has a variable speed setting, you should turn the epilator onto the setting that you wish to use. If there is only one-speed setting, simply turn the epilator on. You should push the epilator gently against your skin, just below the area of hair that you want to remove. Now, you will be able to carefully glide the epilator over your skin against the growth of the hair. The head of the epilator should be kept against your skin so that the tweezers can pluck the hair as close to the skin as possible. Once you have finished epilating you should use a little facial moisturizer on your face. Ensure that you apply it to all areas of the skin where the hairs have been epilated. After moisturizing, it is time to clean your epilator. You should turn it off at the electrical socket and ensure that it is unplugged. You will normally receive a brush to clean the epilator with when you purchase it. Remove the epilating head and clean out any stray hairs with the brush. You can also run the head under running water, as this will wash away any hairs that are too difficult to get to otherwise. You could even soak your epilator head in water with a little dish soap overnight if the hairs are being particularly stubborn at coming out of the epilator. Remember that it is important to keep your epilator as clean as possible as this will keep bacteria away from your skin. Epilating works best on soft skin, so prepare the skin by having a warm bath or shower before starting. Exfoliating is a must in order to prevent ingrown hairs. Don’t apply any creams or lotions to the skin. It will make it difficult for the epilator tweezers to grab the hairs. If it’s your first try at epilation, try to do it a night or day before flaunting your legs. Initially, the skin might get a lot of redness. Epilators don’t work well on long hair. So a day or two before epilating consider using the shaving method. Before starting epilating rub the skin against the direction of hair growth. This will lift them into the upright position and enable to be more effectively caught by the tweezers. Use faster speed for coarser hair, and a slower one for fine hair. Start by epilating the area that is less painful. So you can start with lower legs and move to more sensitive areas as your pain threshold goes up and your skin gets used to epilation. Holding the skin taut can help to reduce the pain and will also help in making hair removal more efficient. Post epilation use some treatment such as moisturizing body lotion to soothe the skin. Epilating your bodily hair means that you will not need to worry about hair removal very often. If you are new to epilating, you should use your epilator once every fortnight. Whilst your hairs are shorter, you’ll not feel as much pain from the process. In addition, you will be able to build up a pain resistance to epilating. Once you feel that you have got used to the tingling sensation of this process, you’ll be able to use your epilator around once a month. Although many women find that their hair grows slows down when they epilate, everybody is different and you may find that your hairs grow back more quickly or less quickly than other peoples’. Whilst some epilators are meant for dry use only, you can purchase some models that are suitable for both wet and dry use. There are several benefits to using a wet and dry epilator. Wet and dry epilators can be highly convenient if you want to save some time. When you are taking a relaxing bath or if you are in the shower, you could use a wet and dry epilator to remove any unwanted hair, allowing you to remove your body hair whilst you are also bathing. Because wet and dry epilators are designed to be used in damp conditions, they are made to be a sealed unit. This means that they are generally cordless. This is convenient, as you will not need to be near an electrical outlet in order to use the epilator. Once you have finished using your wet and dry epilator, you can simply run it under water to clean it off. If you have an epilator that is intended for dry use only, you can only clean it with a brush. A wet and dry epilator allows you to keep the epilator cleaner so that it will not develop a build-up of grease from your skin. When you are in the bath, your skin will become softer and your pores will open up. This will also make epilating less painful. Epilators are a preferred unwanted hair removal method by many people due to its efficiency, as well as fast and long-lasting results. You can also use them in a variety of situations and circumstances since most of them are small and can be taken anywhere with you. For the most part, epilators are inexpensive and unlike other hair removal methods don’t require constant purchase of additional products, such as depilatory creams, razors or waxes. So in the long run, it’s also a money saver. Epilators work for any person and effectively remove any type of hair, from really coarse to really thin and fine hair. With most of the epilators, you can expect to have smooth skin for about 4 weeks. As you continue to regularly use epilation, that time period can extend. The epilators have been on the market for some time and over the years with new developments, they are being designed with features that make it less uncomfortable. How to Make Epilation Less Painful? Although epilation is not the most pleasant experience in the world, especially if you have never done it before, there are some things that you can do in order to make it a little less painful. First of all, you should ensure that you always exfoliate your skin before you epilate. This will remove any skin that is trapping your hairs. Exfoliating whilst you are in a warm bath or shower will also ensure that your pores are opened up and your hairs will be easier to remove. If you have a wet and dry epilator, you will be able to epilate your hairs whilst you are in the shower too, but showering before you epilate is still a very good way of making it less painful even if you have a dry epilator only. You should shave your hairs so that they are shorter before you epilate. You can shave your hairs around two or three days before you are due to epilate your hair so that they have a chance to grow to a reasonable length for the epilator to grab the hairs. When you are epilating your skin, you should pull the skin as tight as you possibly can. This will take away some of the pain and discomfort that you will feel from the hairs being removed. If you are shaving your underarms, you can simply raise your arm over your head, as this will pull the skin taught. Even if you don’t think that the hairs are growing back particularly visibly, you should try to epilate about once every fortnight. This will keep your skin used to the sensation of epilating and as a result, you will feel much less pain. You will also find that the hairs will grow back finer, less frequently and less noticeable. You can reduce the amount of pain and irritation that you’ll feel from epilating if you choose the right epilator. The more tweezers, the better, as you won’t have to go over your skin as many times and you will make the experience go a lot more quickly, exposing you to a shorter amount of pain. You should also look out for specially designed epilators that will lift the hairs before plucking them so that you can be sure that it will pick up more hairs each time. You should use a post epilation cream or gel so that your skin can be soothed after epilating. This will take away any lingering burning sensations that you may experience. Risks and side effects are incredibly low when it comes to epilating, but you should still be aware of the various safety precautions that you should take to ensure that you get the best possible outcome from your purchase. When you epilate, it is not unknown for there to be a chance of infection from the epilator. It is not likely to happen often, but if you don’t look after the epilator properly and keep it clean, you can find that you’re epilating your skin using a dirty appliance. If the epilator also has a shaving attachment, you’ll find that the risk of infection is further increased. You should ensure that you clean the epilator and any attachments after each use and store it in a clean container or pouch when you are not using it. You should always check the operating instructions on any epilator that you purchase. Some are dry use only. This means that you must never get it wet. Getting a dry epilator even a little damp could be very dangerous. A splash-proof epilator is designed to be unplugged and for the body to be run under water, but you will not normally be able to use it in a bath or a shower. If you want to be able to epilate even if you are in the bath or the shower, you should look out for an epilator that has been designed for use in the bath. These are usually cordless to be as safe as possible. The most commonly reported side effects of epilating include ingrown hairs, bumps, and irritation. All you need to do in order to calm these side effects is to apply a post-epilation cream or some other form of cooling to your skin and remember to exfoliate often to reduce the chance of ingrowing hairs. Any method of hair removal can cause ingrown hairs. It might be more common when using an epilator, but by following a proper procedure it can be avoided. One of the common reasons that cause ingrown hairs is the use of the wrong epilating motions. It can disturb the hair follicles and as a result, they will start growing in the unnatural direction. When epilating use the following techniques that will help you prevent ingrown hairs. Hold the skin taut during epilation. This will help to remove the hair root from its follicle and the hair will be less likely to break under the skin. It’s really necessary to exfoliate. It helps to get rid of dead skin cells and lifts the hairs up providing an easy grab for the tweezers. The epilating motion should be done against the natural hair growth direction. Also, the motions should be smooth without any jerks that could lead to hair breaking beneath the skin. You can also use a skin toner after epilating as it will close the port to the follicle, so the bacteria will not be able to invade. If you’ve ever used any kind of hair removal on your body, you may have experienced ingrown hairs. They can be unsightly and difficult to remove once they have become established under your skin. Thankfully, there are some easy ways that you can look after your skin in order to prevent ingrown hairs (ingrown hair serums and tweezers comparison). Every day, you should remember to rob your skin in a gentle circular motion with an exfoliating scrub. This will gently ease out the ingrown hairs that may be lurking under your skin. You should always epilate in the same direction that your hair is growing in. Remember to add a cold compress such as a washcloth or you could even use a post epilation gel or cream so that your skin can be soothed after the hairs have been removed. Some post epilation creams have an anti-inflammatory chemical in them so that you can be sure that any raised bumps will go away as quickly as possible. Raised or swollen follicles can end up causing you to have trapped hairs under your skin. Even if you have very sensitive skin and you don’t want to exfoliate it every single day, you should at least ensure that you exfoliate a couple of times a week. This will ensure that any hairs that may become trapped under the skin are released as soon as possible. If you already have any ingrown hairs, you should make sure that you keep your skin as clean as possible. This will prevent bacteria from getting underneath the trapped hair and causing red and painful bumps on your skin. You should avoid shaving with a razor because this can cause your hairs to become trapped under the skin if you do not do it properly. If you do want to shave with a razor, you should ensure that it has a sharp blade and that you run it under water after each stroke to keep it clean. If you are considering investing in an epilator, comparing the following advantages and disadvantages will help you decide if it’s the right hair removal method for you. It provides some of the longest lasting results. If you’ll want even longer results, there’s only permanent laser treatment (at home laser removal products comparison) left. After each epilation session, you will have about 4-6 weeks of perfectly smooth skin. The hair that grows back after epilation every time becomes finer. After some, the hair will be a lot less noticeable. They are usually available at an affordable price. Moreover, in the long run, they will actually save you money. You buy the unit just once and with proper care, it will last you for more than several years with no parts or supplies that you will need to additionally buy. Depending on the chosen model, it can be used on just about any part of the body. You can invest in an epilator that will have different attachments and heads for use in specific body areas. You can use an epilator anywhere. Also, you can easily take with you traveling. Epilation can be a painful process. However, with time you’ll get used to it and might not even notice the pain anymore. It might take a few sessions before you get the hang of a proper epilation technique. But with practice, you’ll get to that flawless skin result. People with sensitive skin can experience redness after epilation. So it’s not recommended doing it right before leaving the house. To help soothe the skin you can use some lotion. Epilator Vs. Waxing – Which Is Better? Some people enjoy the experience of going to a salon to have their bodily hair waxed. Waxing can be a quick and effective way of removing body hair. If you are not a professional, however, you may find that you struggle to wax your hair properly. Home waxing kits are relatively cheap and are readily available at most beauty stores. The problem is that wax is messy. If you do not manage to get it all off your skin, you will have to then try to remove it afterward. Waxing also hurts. It hurts much more than epilating because when you put the wax on your body, it adheres itself to your skin as well as your hairs. Although your skin may feel smooth after you have waxed, it will also leave your skin looking raw and red. Unlike with waxing, when you epilate your hair, the epilator will only grab the hairs and not your skin. Although you may feel that your skin is irritated after you have epilated, in actual fact, it is your hair follicle that will feel the burn. There are plenty of post-epilating creams that you can use that will take the tingly feeling away from your skin after you have epilated. 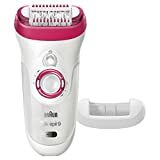 If you want to save money when it comes to removing your bodily hair, rather than going to a professional to have your body hairs waxed, you should consider investing in an epilator. This allows you to remove your body hairs at your own home and you will be able to enjoy the many benefits that waxing can bring without the mess. Epilating, like waxing, allows you to have smoother skin for up to 4 weeks, but instead of paying a professional every time you need to have the procedure done, you can do it yourself from the comfort of your own home at a time that is convenient for you. Here are the best facial wax strips if you don’t want to use an epilator for a smoother skin. Epilator Vs. Shaving – Which Is Better? Most women are familiar with shaving their body hair. If you have been shaving for a while, you will notice how quickly the hairs can grow back. Sometimes, you may need to even shave every day just to keep those body hairs away. If you have particularly dark bodily hair, you may find that these hairs can grow back even more quickly each time and as they are dark, they are very visible. Disposable razors are an incredibly costly way of keeping your skin smooth. They will only last for one or two uses before you realize that the blades have become blunt. If you are using your razor daily, then you will need to replace your razors often. Even if you use an electric shaver, you will need to replace the shaving foil from time to time. Another problem with electric shavers is that you cannot get as clean a shave as you can get with a razor. Epilators, on the other hand, is quick and easy to use. You will notice some pain, which you will not feel when you use a razor or electric shaver, although this pain is akin to mild discomfort and will not last for a long time. Once you have epilated, you will not need to do it again for at least a couple of weeks. This can enable you to go on vacation or to work away from home without worrying about taking your razor or shaver with you. If you don’t mind a little discomfort for a minute or two, epilating is far more convenient than shaving. It will save you money in the long run and it can even help to minimize your bodily hairs when they do grow back. Q. Does more hair grow back if I epilate? A. Epilating is not a permanent hair removal solution. You can expect for more hair to grow back in the area where you have epilated but there will not be more hair than there was before you began. It will not grow back quickly and you can expect to be able to wait around two weeks before you need to consider epilating your hair again. Q. How to prepare skin for epilation? A. Before you epilate, it is important that you have clean and dry skin. Ensure that you take a warm bath or shower before epilating, as this will open up your pores and make the experience less painful. You should also ensure that you exfoliate your skin well as this will remove any dead skin that may be trapping the hairs beneath the skin. Q. Benefits of using a wet and dry epilator? A. A wet and dry epilator will allow you to use it whilst you are showering if you wish. Because it is safe to use in the water you can run it under the faucet to clean it, which allows you to maintain better hygiene when using your epilator. Q. How to exfoliate for epilation? A. If you are going to epilate the hairs on your body, you should ensure that you exfoliate your skin well. The best way to exfoliate your skin is to use at body scrub along with an exfoliation device. You may choose to use a sponge or an exfoliating mitt, but whatever you choose, you should ensure that it is designed for exfoliating the area of skin that you are intending to epilate. Q. 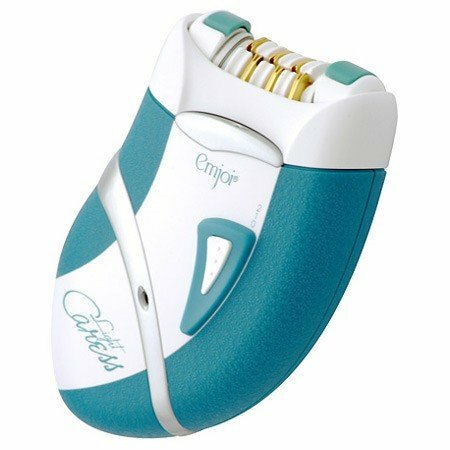 What areas of the body can an epilator be used on? A. You should read the instructions when you purchase your epilator to ensure that you are aware of where it can be used. Some epilators are only meant for use on the legs and arms. The ones that are in the middle of the range can epilate your legs, arms, underarms and bikini line. For the very sensitive areas on the face, you can find some epilators that will allow you to use them on the face as well as the legs, arms, bikini line and underarms. Q. When is the best time to epilate? A. When you are planning your beauty routine, remember to leave epilating until later on in the evening. Even though it is relatively painless after you have been doing it for a while, an epilator will still leave your skin looking a little red and bumpy after you have used it. If you epilate in the evenings, you will find that your skin has time to recover by the morning. Q. How important is exfoliation? It is very important to exfoliate before you epilate your hairs. Exfoliation will remove any skin that is trapping hair so that you will be able to remove all of the hair from your skin. Another thing that exfoliation will do is prevent ingrown hairs. You should ensure that you exfoliate frequently if you use an epilator, as this will help you to maintain healthy skin. Ingrown hairs not only look unsightly, but they can cause scarring and a build-up of bacteria in the affected hair follicle. A. One of the great things about using an epilator is that it does not pull on the skin. If you have ever waxed in the past, you will have noticed that your skin feels as though it is burning and red after the experience, but with an epilator, you will not have the same sensation. Because an epilator will not pull on your skin, it is a far better solution for those with sensitive skin. Q. How to clean an epilator? A. The way that you clean an epilator will depend on the model. If you have chosen a wet and dry epilator, you will be able to run the epilator head underneath your faucet or shower. If your epilator is only designed for dry use, you may have to disassemble the epilator in order to clean it. Remember that you should not run the body or the cable under water. Make sure that the epilator is turned off before you start to clean it and all unplug it from the power supply. You can then use a brush, which is usually provided, to gently sweep away the hairs from the mechanism. Q. Will epilation reduce my hair growth rate? A. Clinical research has shown that epilation slows hair growth due to the fact that epilators penetrate to the hairs deeper and remove them at the root. Of course, the time of growth changes depending on the hair growth phase they are in. Plus, the hair grows softer and finer to the touch afterward the epilation process. Q. Is it okay to let someone else use my epilator? A. It is not a good idea to share an epilator with someone else because no matter how thoroughly you clean it there may be some dead skin or blood or even hair left on it. This remaining tissues may cause some infections to transfer to each other. Therefore, we do not recommend this at all. Q. Will the epilation process darken my skin? A. The answer is no. It is very unlikely that epilation will cause your skin to get darker. Braun – Braun is a great brand that you can rely on when it comes to good epilator models. You can find something for most price ranges, with basic models offering dry epilating only, with the more expensive models offering soft lift technology, wet and dry use and multiple attachments so that you can use the epilator on any area of your body. Emjoi – You can trust Emjoi to provide you with a high quality and effective epilator. These epilators come with plenty of tweezers in their epilating heads so that you can be sure that all hairs will be removed as quickly as possible. Epilady – Epilady is a brand name that is well known in America. You can purchase epilators from this company that is designed for very sensitive skin, whilst the more effective Epilady epilators are for those with a much higher pain threshold. Panasonic – when it comes to epilators, Panasonic is a name that you can trust. This is a brand that produces plenty of different electronic items. In the many decades at that Panasonic have been in operation, there have been many great beauty devices available including high-quality epilators. You can be sure of the durability of these epilators and they usually come with a good warranty. We would definitely recommend choosing epilation as a great hair removal method. It’s so popular for a reason. You’ll have long-lasting results and a beautifully smooth skin. It might take some getting used to, but you will love the results. Another hair removal option you can consider is electrolysis (best home electrolysis hair removal products). We hope that with our best epilator reviews you will find the product that will provide you with the most efficient performance. When I don t have any opportunity to go to a salon I use Braun epilator. As for salon epilation I prefer laser one I think it is trendy and rather safe but expensive. I choose salons where they use 1S PRO (Innivatione) cause I know that it is effective. Smooth Skin Lab Copyright © 2019. Smooth Skin Lab. All Rights Reserved. 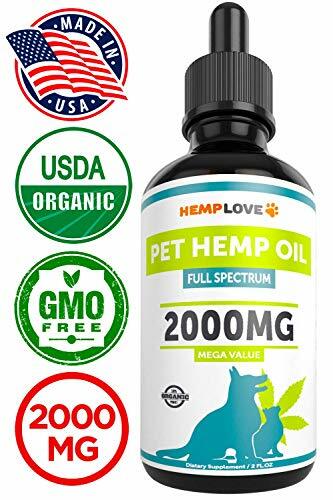 smoothskinlab.com is a participant in the Amazon Services LLC Associates Program, an affiliate advertising program designed to provide a means for sites to earn advertising fees by advertising and linking to amazon.com.